Canada's getting just less than 550 of them for 2010, sold only through SVT-authorized dealers which includes a standard Luxury Package featuring 10-way heated leather seats with memory, dual-zone automatic climate control, six-CD stereo, auto-dimming exterior mirror and power-adjustable pedals that are an option on U.S. trucks. It's a lot of money, but then, it's a niche market, and this is a specialty truck with unique features. It's impossible to outfit a regular F-150 exactly like it, at any price. And more importantly, and very unusually for this much off-road ability, it also has impeccable on-road manners. You can take it through the roughest terrain (Ford has also tested it extensively in snow and mud, obviously more common than desert sand around here) and then aim it down the Don Valley Parkway in almost ridiculous comfort, instead of paying once for a weekend toy and then again for a workday commuter. 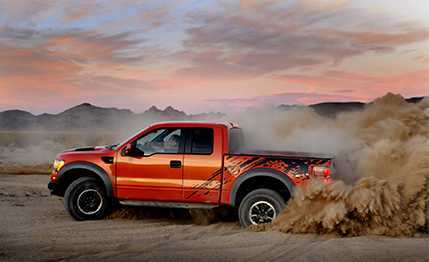 The Raptor comes only as a Super Cab, with rear-hinged back doors, and with a 5-foot-5 box; the short wheelbase adds with its agility. The sole engine is a 5.4 L V8, producing 320 horsepower, with a six-speed automatic transmission. Ford will add an optional all-new 6.2 L V8, churning out an estimated 400 horses later this year. Four-wheel-drive is naturally the only configuration available. Unique touches start with the body, which is almost 178 mm wider than a stock F-150, necessary to accommodate the wider suspension and Raptor-specific, 35-inch BF Goodrich tires. The extra width requires clearance lights, slick little LEDs at the four corners, along with three tucked into the huge grille that carries the brand name across its width. 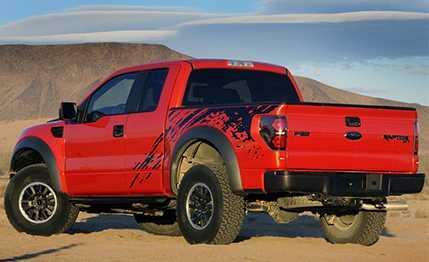 Raptor's fenders and fascia also round off the conventional F-150's cinder block styling, while the interior includes SVT-specific gauges, wheel and trim. Four auxiliary switches on the console are pre-wired and fused with easily accessible harnesses, making it simple to hook up such extra items as winches and lights. 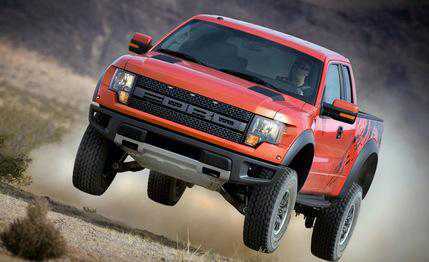 The F150 SVT Raptor's heart is in its suspension. Ford turned to racing shock manufacturer Fox Engineering, which created a new and rebuildable internal-triple-bypass shock that, unlike most of Fox's products, you can only buy when the rest of the Raptor is attached. Ford says it's also the first time any production truck has used this type of shock. The shock stiffens as it compresses, becoming some four times harder at the end of the stroke. The suspension is unique to Raptor, and travel is 284 mm in front and 307 mm in rear – again, more what you'd expect from a homebuilt rock crawler. The truck also includes a new electronic locking differential that will remain engaged at any speed; the company says most competitors' units disengage at around 32 km/h. 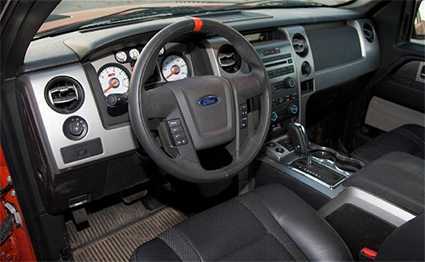 Raptor's hill descent control is new for Ford; other features include a 2,721 kilogram towing capacity, trailer sway control, tow haul mode, and a factory-installed trailer brake controller. An off-road mode button alters the throttle and transmission performance, and the electronic stability control can be turned off entirely when desired.